An early teacher of Arthur's, Georges Izambard, encouraged him to read Rabelais and Hugo, to the outrage of his protective mother. By the age of 15 Rimbaud was already a poet and started running away to Paris and Belgium. Returning to Charleville, he shocked librarians there by reading books on socialism, magic, and alchemy as well as licentious novels. He responded with a scathing poem, "Les Assis" (Those Who Sit). He was also violently anti-religious and wrote his sister a scandalous poem "Les Premieres Communions" upon her first communion. He wrote, "I long for the days of antique youth, of lascivious satyrs, and animal fauns, gods who bit, mad with love, the bark of boughs, and among water-lillies kissed the Nymph with fair hair!" In 1871 Rimbaud wrote Izambard: "I'm lousing myself up as much as I can these days. Why? I want to be a poet, and I am working to make myself a seer. . . the point is, to arrive at the unknown by the disordering of all the senses." He sent some of his writing to the poet Paul Verlaine, who responded, "Come, beloved great soul, you are called, you are awaited." With misgivings about literary society in Paris, Rimbaud nonetheless moved in with Verlaine, his wife and her parents, taking with him his poem "LeBateau ivre" (The Drunken Boat): As I was floating down unconcerned rivers, I no longer felt myself steered by the haulers...the Rivers let me sail downstream where I pleased. In 1873 Verlaine convinced Rimbaud to move to London with him, where the two possibly try opium and Rimbaud writes about the horrors of city life as well as "Nuit de L'enfer" (Night in Hell), of taking another more wicked "poison." 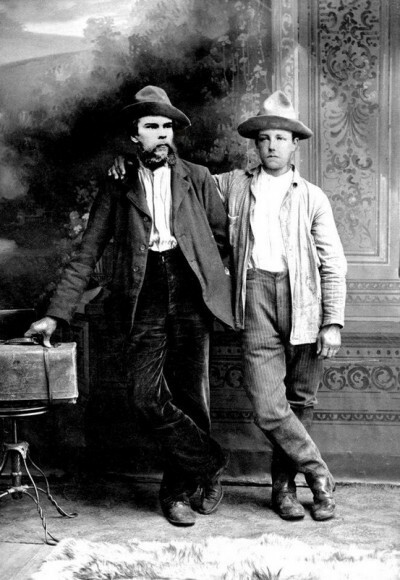 After Rimbaud fell in love with a girl, Verlaine shot him in the wrist after a quarrel. Verlaine served two years in prison for the crime and Rimbaud renounced the literary world forever. He wrote in "Memoire": Ah! the pollen of willows which a wing shakes! The roses of the reeds, long since eaten away! My boat still fast; and its anchor chain taut to the bottom of this limitless eye of water, - in what slime? Rimbaud travelled to Germany, Switzerland, Italy, and Egypt and studied German, Spanish, Arabic, Italian, Dutch and modern Greek. He joined the Dutch colonial army, worked as a trader, gun-runner and slave trader, and explored the unknown region of Ogadine, writing a report on it for the Societe de Geographie which they published. He lived with one or two women, but never married. He had finally amassed some earnings when he died at the age of 37 after a sinovial tumor on his knee was aggrivated by travel and hardship. Pictured: Paul Verlaine and Arthur Rimbaud in 1873.